Opera want to make a great comeback with their new feature in their browser. Opera is the first browser to come with the VPN pre-installed for the better online privacy. With this feature, Opera want to increase the privacy improvements. Most of the options available on the present desktop browsers were available on Opera long ago. Opera intends to include this feature after reviewing their product plans, and people also need new features for the efficient browsing. 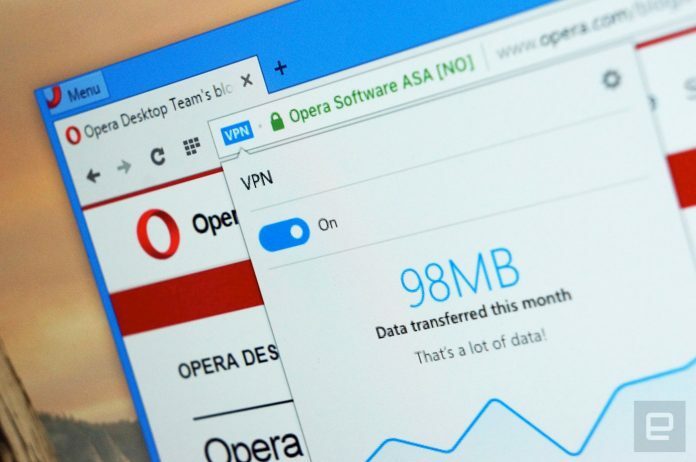 Although we use different VPN traditional software, Opera has come up with the unique feature by integrating the VPN directly within the browser. One can enable and disable the VPN very easily while browsing the internet. So don’t be late and it’s the right time to install and switch to the opera browser. Go to the settings after installation there you can find the VPN under the Privacy and Security. Then enable the VPN by marking on the checkbox. Currently, the feature is available for the Opera Developer Browser only. VPN is also called as Virtual Private Network. This helps to improve the functionality, security and management in the private network. VPN creates the point to point connection with the support of the dedicated connections by the traffic encryption methods. According to the Global Web Index, more than half a billion are currently using or tried the VPN services. This means nearly 24% of the world’s internet population are connected with the VPN services. Based on the survey many people use VPN for entertainment content, robust while browsing, for accessing the restricted sites at the work place, to communicate with friends/family abroad. So better than the existing VPNs Opera has come up this VPN feature. One must use the VPN for many reasons while surfing on the internet. By using the VPN, it acts as the shielding to your browser and keep you away from browsing from a public network provider and let your identity be in private. So you will not be followed by the unwanted ads, and mainly we use VPN for ensuring the privacy. With one click on the VPN, you can able to perform several operations like Hide your IP address, Unblocking of firewalls and websites and Public Wi-Fi security. This opera developer browser is available for the Windows, Mac, and Linux operating systems.